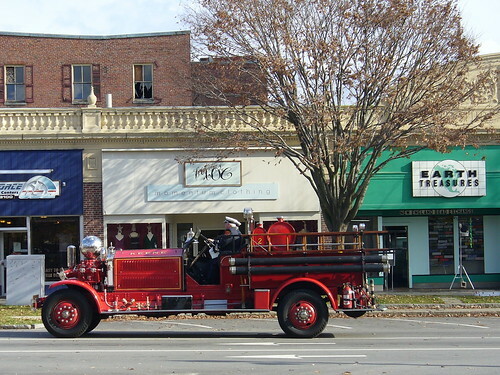 Earlier this month when I was downtown photographing the Christmas be-bulbed trees along Main Street, I snapped this photo of a vintage fire truck, part of a passing procession I later learned was headed toward the funeral of a retired firefighter. When I composed the shot, the truck was perfectly centered in my viewscreen; by the time my digicam captured the image, though, the truck had moved off center. Reviewing the photo when I got home, I considered cropping it, but something in me liked the off-center composition. At first, I thought it was the diagonal balance of truck and branching tree, but ultimately I decided that it was the sign for Earth Treasures, a downtown store selling beads, polished stones, and science-themed gifts and toys, that I found aesthetically pleasing. If I cropped the photo with the truck as its focus, I’d lose the sign. If I kept the photo as-is, I’d retain the visual trinity of truck, tree, and background facade. 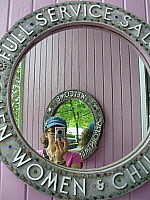 Last night at the brink of sleep, I realized what I’d liked about that sign: Earth Treasures. 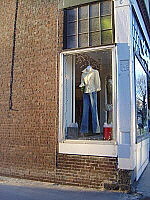 The name of Keene’s local bead and trinket shop contains within it the English name of Ji Jang Bosal, also known as Jizo or Ksitigarbha, the “Earth Treasure” Bodhisattva whose name Buddhist mourners chant when a loved one dies. How fitting that my shutter-snapping eye instinctively knew to capture the accidental sight of a funeral-bound firetruck rolling past the Earth Treasure’s eye. 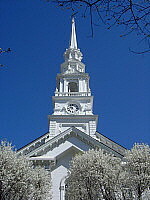 This is the “November” image in my 2007 photo-calendar: an appropriate picture, perhaps, for the month of All Saints and All Souls. You can see the featured photos here, and you can order a copy here. Enjoy! This past Friday’s Photo Friday theme was Immature, so here’s an image of an immature penguin I shot before darkness fell at the Columbus Zoo, where my eldest sister and I went to see this year’s Wildlights display on Friday, my last night in Ohio. In an attempt to avoid the usual Sunday surge of post-Thanksgiving traffic, Reggie and I made the 13-hour drive from Columbus to Keene on Saturday, Reggie’s role being to sleep and necessitate occasional stretch breaks while my role was that of sole driver and navigator. Yesterday was dedicated to unpacking, re-acclimating, and otherwise settling in, and today is my usual grading day, a chance to catch-up (still) on the papers I took to Ohio but didn’t get around to reading. Although it’s always good to see my family in Ohio and even better to return to my quiet life here in New Hampshire, it’s also a bit disorienting to move so quickly from one life to another. In the past, I’ve driven home to New Hampshire on Monday, barely unpacking my bags and settling my head on my home pillow before rising to teach Tuesday’s 8 am class, a pattern I knew I didn’t want to repeat this year. Having Sunday for leisurely re-entry and today for grading catch-up seemed a saner approach than milking a few extra days in Ohio. Another choice made in the interest in sanity is the no-brainer decision to call it quits on this year’s attempt at NaNoWriMo. Although this is the first time in three years of taking the novel-in-a-month challenge that I happened upon a book idea I’d truly like to pursue–a spiritual memoir describing how a good little Catholic girl went from being a born-again Christian to being a Zen Buddhist–this is also the first year I’d decided to do NaNoWriMo at the last minute, having decided that I didn’t have time to write a So-Called Novel during a month when I was teaching six classes. As it turns out, that initial instinct was correct. Although I theoretically could have written 50,000 words toward that spiritual memoir had I stuck to a daily discipline of about 1,667 words per day, I quickly fell behind with that goal and never caught up. At a certain point, I decided it wasn’t worth consuming too much caffeine and getting too little sleep to write a crappy first draft of a project I want to spend more (and more quality) time on. And so yesterday, my first morning back in Keene, I woke, walked the dog, and then settled in after breakfast to write by hand in my Moleskine, as I was wont to do back in October, before NaNoWriMo made it desireable for me to write via laptop so each and every word could be counted toward the 50,000-word goal. Given that I started NaNoWriMo this year as a way to jump-start my writing, I’d say the attempt was successful even though I didn’t “win” the challenge: somewhere short of 20,000 words, I figured out what I really want to be writing, and how. And that, in my book, is the exact opposite of Immaturity. I’ve been largely offline this week, losing patience with the dismally slow dial-up Internet access at my parents’ house and checking on my online classes during trips to Panera that are limited by the staying-power of my laptop battery. Even if I had a lightning-fast Internet connection at my unlimited disposal, though, I probably wouldn’t be blogging much, feeling singularly uninspired. Columbus, Ohio is the place I grew up, but it’s also the place I left when I went to college in Toledo, moved to Boston for grad school, and then settled “for good or the time being” in New Hampshire. Columbus is the place I’ll always call home, telling folks who ask me where I’m from that I hail from Ohio, not New Hampshire…but it’s a place that no longer feels like home, life here in the quietly monotonous flatlands feeling exceptionally far removed from the hubbub of stimulus that is my life in the hilly Northeast. It’s not so much that I’m bored in Ohio since I brought plenty of papers to grade and other things to keep me busy. It’s just in the presence of so much homework, I feel simultaneously tied to and entirely separate from home, wherever that is. I’ve written before about the curious sensation of being betwixt and between I feel whenever I leave my New Hampshire home to visit my Ohio one, and this trip is no different. Although I thought that coming “home” (or to my “home home,” as I started calling Columbus when I was an undergraduate in Toledo, thereby distinguishing it from the “home” that was my University dorm room) would provide a much-needed jolt of inspiration to the NaNoWriMo “novel” that I’d turned into a spiritual memoir, the exact opposite has happened: now that I’m “home home,” the last thing I want to do is think and write about the weirdly wending path that led me to my curiously Zennish existence in Keene, NH. Feeling uninspired to blog, I’m also uninspired to write, figuring I might shelve this current memoir-ish thing until a time when I actually feel inspired to write something rather than continuing a vain attempt to make-up word-count to meet an admittedly arbitrary goal. Given my current uninspired state, it seemed fitting to post the above picture of a trashed sofa. Whereas in the hilly Northeast, we stash our unwanted couches in front of our homes, here in the Ohio flatlands, we stick unwanted furniture in the alleys out back. Maybe a forgotten back alley is exactly where I should leave my currently inactive Muse. 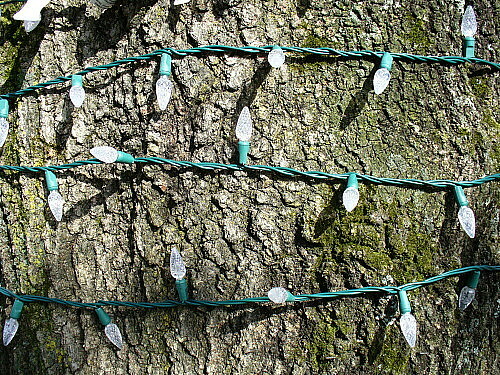 All of the large trees along Main Street and in Central Square have spontaneously sprouted unseasonal strings of bulbous growths: Christmas lights already in November. 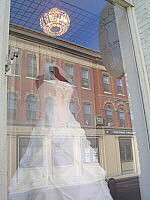 When I spotted the first be-bulbed trees alongside some garland-wrapped and red velvet-ribboned lamp-posts, I groaned. After I’d boasted in October of how downtown Keene doesn’t rush the winter holidays, how dare city crews defy me by putting up Christmas decorations in November? 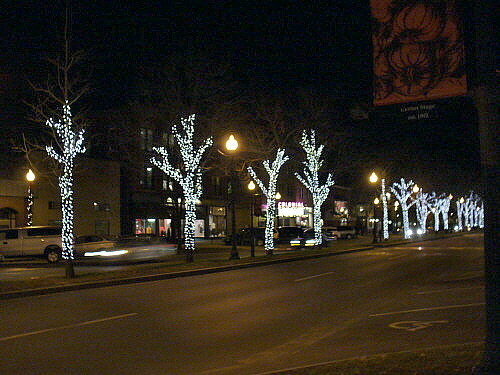 I stopped groaning, though, when I saw how a Main Street of Christmas be-bulbed trees looks at night. I think even my Inner Grinch can get used to seeing glowing trees in an unseasonably mild November. I’m off to Ohio for Thanksgiving week, during which time blogging will be unpredictably occasional. While I’m gone, consider submitting links to your own tree posts and pictures (bulbous or otherwise) to Jade of Arboreality, who will be hosting the next Festival of Trees. Submissions are due by November 29 and should be sent to jadeblackwater [at] brainripples [dot] com; please put �Festival of the Trees� in the subject line. 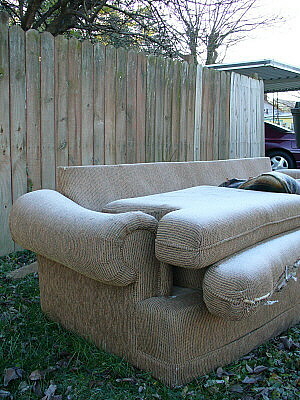 Here’s the latest installment in my apparently ongoing series of abandoned couch images. 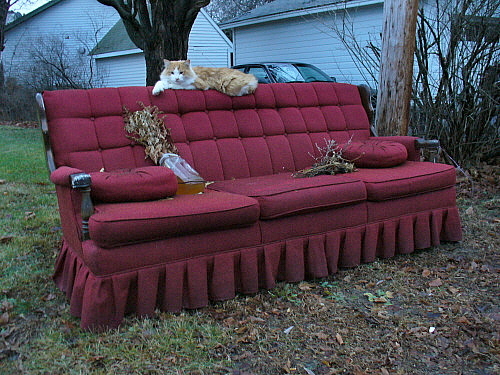 Yes, this is the same couch that appeared outside a neighbor’s house at the beginning of the month, only to be covered in frost several days later. 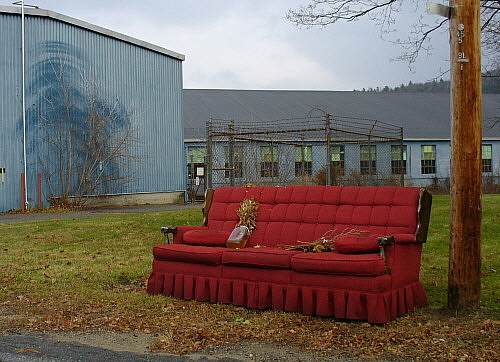 When I’d seen two college girls carrying the couch around a corner several days later, I assumed they’d “adopted” it for a nearby apartment, but recently it’s re-appeared on a dead-end roadside near a local factory, having acquired a dead bouquet of flowers in a jar of vile yellow liquid. This morning, the couch had collected a lounging house cat as well. I’m eagerly awaiting the spontaneous arrival of more roadside couch accoutrements such as a beer-chugging guy with a television set or a bathrobe-swaddled woman in curlers and bunny slippers. I’ve never understood the simile “working like a dog.” In my admittedly limited experience, none of the dogs I know work particularly hard; instead, Reggie spends most of his life sleeping on the floor or couch, and these neighborhood dogs seem to have a similarly work-free situation, climbing out a second floor window to watch passersby when their college guys aren’t in the mood to toss frisbees in a nearby field. As for me, I’ve been working harder than a dog lately, being perpetually buried with grading. Fall is always my busiest semester, and this fall I’m busier than usual with a double course-load and several new courses to prepare. The ongoing cycle of collecting papers, grading papers, returning papers, and collecting more is starting to wear thin, and when you add a So-Called Novel to the mix, you end up with one tired puppy. Other folks look forward to the rest and relaxation that Thanksgiving affords. This ol’ dog is looking forward to Thanksgiving as a chance to play grading and writing catch-up. There’s nothing more tantalizing than a closed ice cream stand. Although it’s been months since I’ve craved much less had ice cream, on Saturday’s warm and sunny walk at Great Brook Farm with Leslee, the nearly ubiquitous signs pointing toward the farm’s ice cream stand were a cruel tease: the stand closed for the season in October, but the signs remain to point the way to where ice cream was once found. 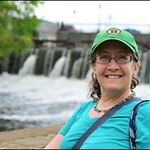 Although there were no ice-cream scoopers anywhere near Great Brook Farm on Saturday, the park itself was crowded with local dog-walkers, mountain bikers, horseback riders, joggers, and families with kids and baby-strollers in tow. Saturday was one of those days that reminds you of all the things you wanted to spend the entire summer doing but seldom had time for: one of those second-chance days when you play hooky from household obligations and use any excuse that presents itself to get and stay outside. Saturday’s warm and sunny weather notwithstanding, you can’t buy ice cream at Great Brook Farm now that the summer is officially over…but you can buy other by-products from the Farm’s dairy herd. And although I didn’t see any live pigskins, signs suggest the porkers are somewhat less than friendly: beware!